Tea hut illustrates Greenham’s trick of depicting a scene from a raised viewpoint, from which he can observe and transcribe the patterns of movement and the play of shade in his chosen scene. 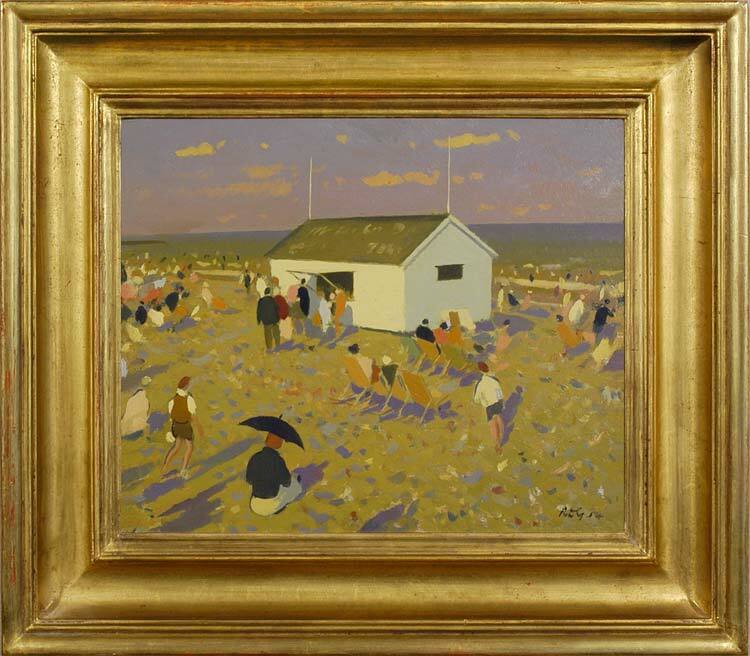 Here, the beach life of the 1950s comes to vivid (but tranquil) life around the white hub of the tea kiosk, with the serried purple shadows of people and deckchairs opening a bold diagonal path towards the open stretch of the North Sea. The roseate and mauve tones conjure the late summer light, as afternoon slips into evening. This is an archetypal image of the English seaside, to set alongside the Deauville scenes of Bonington and Monet.